Earl Robinson, the first African American to serve as an Assistant Director of MNPL, speaks at IAM Headquarters in Upper Marlboro, MD. 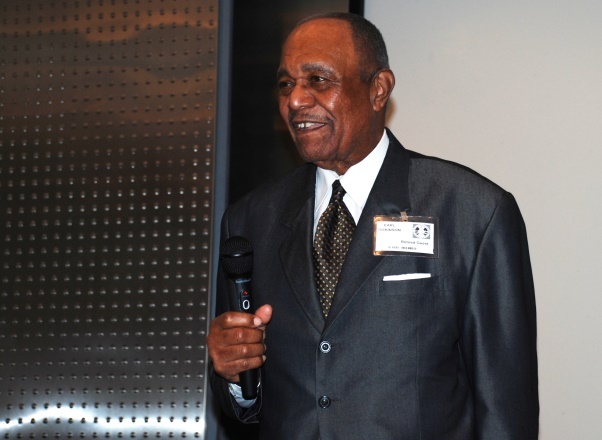 Former Machinists Non-Partisan Political League (MNPL) Assistant Director Earl Robinson, the first African American to serve in that position, recently spoke about his trailblazing career at IAM Headquarters as part of the IAM’s ongoing tribute to Black History Month. His job was to travel the country and raise money. It wasn’t always an easy task for an African-American man in the 1970s. Robinson was often one of the only African Americans in the room while he gave speeches asking for support for pro-IAM political candidates. “If you’re going to go into a crowd and ask people to part with what they view as holy, you better have some people skills,” said Robinson. Robinson, a veteran of the U.S. Air Force, joined Local 15 in Houston, TX, as an employee of Cameron Iron Works. While at Local 15, he served as a Shop Steward, United Fund Solicitor and co-chairman of MNPL. He was also a member of the A. Philip Randolph Institute and co-chairman of the Black Affairs Committee of the Texas AFL-CIO.